This apartment enjoys a wonderfully tranquil location in the Lake District, with the stunning landscape of Skiddaw as a backdrop. The area around the apartment is perfect for enjoying scenic walks or mountain bike rides, whilst more adventurous visitors may like to hike to the summit of Skiddaw. Just a few miles north of the property, Bassenthwaite Lake is the most northerly lake in the region and is a popular destination for keen sailors. On the northern shore of the lake, the Lakes Distillery offers tasting tours and is also home to a bistro and a group of resident alpacas who visitors are able to handfeed. Two miles south of the property, the town of Keswick is a vibrant market town offering a good range of shops and eateries, as well as a museum, the intriguing Puzzle Place, and an indoor climbing centre. Guests staying at this ground-floor apartment are in for a treat, as it has been lovingly maintained by the owners to create a stylish and comfortable retreat. Passing through the courtyard garden, guests enter the property through the conservatory, a peaceful spot to relax on the armchair and sofa and enjoy the views over the gardens. Double doors lead through to the lounge/diner, a spacious room which has been tastefully decorated, offering two inviting sofas from which guests can enjoy the warmth of the wood burner and a favourite programme or film on the Smart TV/DVD. A window seat is a great place to sit with a good book, whilst the dining table with its leather chairs is perfect for enjoying leisurely meals into the late evening. Moving through to the kitchen, guests will find a light-filled space with a contemporary feel to it, which is well-equipped offering an oven, hob, microwave, fridge/freezer, coffee machine, dishwasher and washer/dryer. The first of the property’s two bedrooms is a delightful king-size room which is accessed via three steps down and offers an en-suite bathroom with shower over bath and WC. 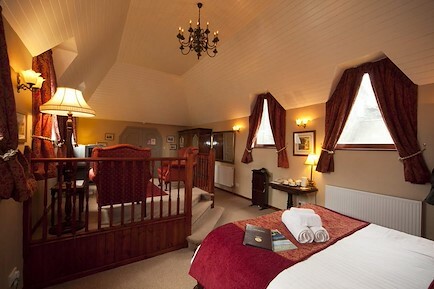 The second bedroom is a charming twin room, which can be made up as a king-size on request. The shower room, close to the twin bedroom has a shower and WC. Guests staying at the property enjoy access to the extensive shared gardens, which offer a magnificent amount of space comprising lawns and terraced seating areas. There is also a pond and a small stream which add pretty touches to the grounds. Please be aware that the pond is deep and unfenced and there are also some steep drops around the grounds, therefore children must be supervised at all times. There is off-road parking for two cars. Located in the tiny rural hamlet of Guardhouse, the property sits in the Glenderaterra valley with dramatic scenery to both sides. Set out on foot to follow the number of easy and challenging walking routes that dissect this stunning area. The village of Threlkeld is within easy reach and is home to two popular pubs serving local dishes and ales. A short drive will bring you to Keswick, a bustling market town with excellent shops, museums, a theatre, cinema and host of restaurants and cafes. From the small entrance hall, stairs lead up to the open-plan living area. With huge exposed beams, a pitched roof, stone walls and magnificent views, this is a beautifully designed space. At one end, a contemporary kitchen area features oak floorboards, modern units, ample work space and a large dining table. Two leather armchairs sit in a tall oriel window, which offers spectacular views of Blencathra’s peak. The sitting room area beyond is cosy and inviting with comfortable sofas, a large wood burner and glass picture windows opening onto a raised deck overlooking the valley. Downstairs are three stylish bedrooms with slate floors, stone walls, exposed ceiling beams and tasteful furniture and soft furnishings. The king-size master benefits from an en-suite shower room, while the twin bedroom and super-king-size share the main bathroom with shower over bath. Outside, a sunny decked terrace with table and chairs overlooks a pretty garden of lawn, trees and shrubs below. Your enquiry will be sent directly to Lakeland Cottage Company. Please fill in as much detail as you can.